Rajasthan’s very own marble marvel is the Jaswant Thada mausoleum in Jodhpur, which is more commonly known as the Taj Mahal of Mewar. Hidden amidst lush green trees and perched tenderly on lakeside, Jaswant Thada is a monument a tourist would never want to miss while in Jodhpur. The cenotaphs and domes carved in intricate and traditional Rajasthani fashion make Jaswant Thada a charming sight to behold. 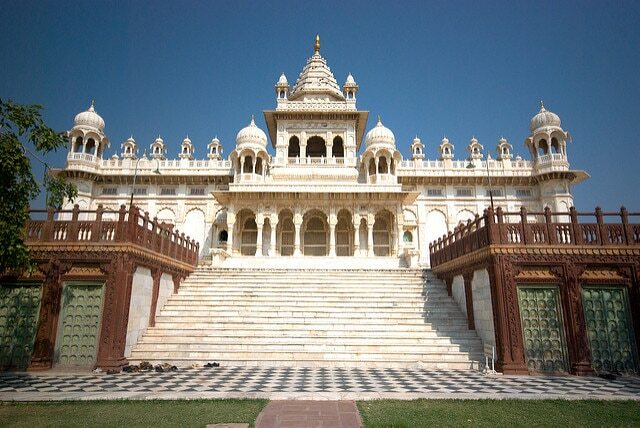 Take a theoretical look at this pretty mausoleum before you plan your visit to Jodhpur. Jaswant Thada is named after Maharaja Jaswant Singh II, and it was built by his son Maharaja Sadar Singh in the year 1899. Made of pure white marble that still retains all of its allure, Jaswant Thada also consists of some paintings of the previous rulers of Mewar. Not only are the cenotaphs built of white marble, they are contrasted in red with the steps leading up to the monument, giving it a much vibrant appeal. The shallow lake lining Jaswant Thada was used for performing rituals for the deceased, and it now has a few ducks swimming about. Local musicians and folk singers sit on the steps of the monument to greet the visitors with some authentic Rajasthani melodies. The memorials built inside the monument are beautifully decorated with some elaborate artwork and give a history of whom they are dedicated to. Arches and pillars around the main marble monument at Jaswant Thada are adorned with some delicate carvings, the inside walls of which bear paintings and pictures of the deceased rulers. While the entire building is made in traditional Rajasthani style, the domes are inspired from some of the most creative Mughal architecture, a testament of how the Rajput rulers blended Mughal patterns in their constructions. Along with the shelters bordering the main monument amidst lush greenery and the contrasting colours under the sunlight, Jaswant Thada is quite a mesmerizing sight. The first thing any visitor would be compelled to do is observe how the lakeside location of Jaswant Thada makes it such a serene place. Taking a walk along the vast enclosure will help a tourist admire the intricate carvings and at the same time look into the history of the rulers of Mewar whose memorials are situated in the monument premises. There are expansive lawns across the grounds of Jaswant Thada where visitors can lounge and bask in the pleasant atmosphere. Along with the memorials, there is also a separate cremation ground of the royal families, where the remains of burnt wood can be seen upon visiting. The squirrels and birds scattered around the grounds of the memorial create a rather calming surrounding, and should certainly be captured in pictures. While visiting the famous Mehrangarh Fort of Jodhpur, Jaswant Thada deserves a visit as it is quite relaxing and is hardly very crowded. Wear comfortable shoes if you plan to visit more than one place in the city. Carry hats and sunglasses along if visiting during the day time or the summer as it gets quite hot in Jodhpur. Shoes are required to be removed while at Jaswant Thada, as it is a way of paying respects to the deceased. Take a combined tour of Mehrangarh Fort and Jaswant Thada since the two monuments are located quite close to one another. Carry bottles of water along if you plan to spend a lot of time at both Mehrangarh Fort and Jaswant Thada. Cameras are allowed with a fee, so make sure to click some amazing pictures while at the mausoleum. Having a tour guide along will help delve into the history of Maharaja Jaswant Singh and other rulers of Mewar whose memorials are present at Jaswant Thada. The view of Umaid Bhavan Palace from the mausoleum is an attractive sight that no tourist should miss. It takes about 30-45 minutes at Jaswant Thada on an average based on the number of things to see. Jodhpur can be reached from any major city or town in India by air or rail. Jaswant Thada is on the way to Mehrangarh Fort, which is located in the heart of the city, so both the places are easily accessible. Tourist buses and/or taxis are available from everywhere in the city area of Jodhpur which can be made use of to reach Jaswant Thada. Mehrangarh Fort is an obvious choice as it is the closest landmark near Jaswant Thada. The main city market can be found below the hill on which Mehrangarh Fort is situated, so it is close to Jaswant Thada as well. Umaid Bhavan Palace, Khejarla Fort, Balsamand Lake, Kailana Lake, Ranisar Padamsar, Gulab Sagar Lake, Ganesh Temple, and Pal Balaji temple are all located close by. 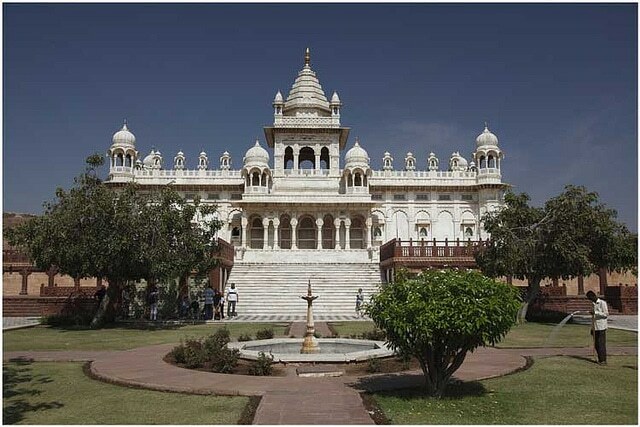 Jodhpur’s historical importance can be witnessed through visiting the Jaswant Thada as it is a unique representation of the Mewar royals and their unusual architecture choices that make the city a vibrant tourist attraction.